Digital subtraction angiography (DSA) is the standard imaging modality to diagnose RAS. However, it is invasive, requires intravascular iodinated contrast media and uses ionizing radiation. Contrast-enhanced magnetic resonance angiography (CEMRA) is non-invasive, does not require intravascular iodinated contrast medium and does not use ionizing radiation. , However, CEMRA is expensive and may not be available in many medical centers. Also, considerable expertise is needed to analyze the images. It requires the use of gadolinium as the contrast agent. The reported side-effects of gadolinium include back pain, renal scarring and nephrotoxicity. , Color Doppler ultrasound (DUS) has been proposed as a screening tool in detecting RAS. It is less expensive compared with DSA or CEMRA, noninvasive, does not require ionizing radiation or intravascular contrast medium and allows direct visualization of the renal arteries (on both B mode and color Doppler) as well as hemodynamic assessment of renal artery blood flow. However, it is a very operator-dependent imaging modality. The parameters used for the detection of significant RAS are also variable. The DUS parameters are divided into direct criteria parameters (derived from measurements taken at the main renal artery) and indirect criteria parameters (derived from measurements taken at the intra-renal arteries). The direct criteria parameters include the peak systolic velocity (PSV) taken at the proximal/mid- and distal renal artery and the acceleration time (AT), which is the time taken from the beginning of the systolic upstroke to the first systolic peak. Calculation of the measured ratios such as renal-renal ratio (RRR), which is the ratio of the PSV of the proximal/mid-renal artery to the PSV of the distal renal artery (PSV-P/PSV-D), and the renal-aortic ratio (RAR), which is the ratio of the PSV of the proximal renal artery to the PSV of the suprarenal aorta (PSV-P/PSV-A), are useful for the evaluation of the main renal artery. Indirect criteria parameters include resistive index (RI) and "tardus-parvus" phenomenon in the intra-renal arterial Doppler waveforms. The RI is the ratio of the PSV and the end-diastolic velocity (EDV) of the intra-renal arteries or segmental branches. RI indicates resistance within the small intra-renal arteries. Normal RI values range from 0.56 to 0.07, and an increase in RI value 0.8 is associated with renal parenchymal disease, poor renal function and kidney edema as seen in obstructive uropathy and acute post-transplant rejection. Reduction in RI value below 0.56 indicates significant main RAS. An important factor in ensuring accurate measurements of DUS parameters is a technically adequate examination. Technical success is defined as visualization of the main renal arteries bilaterally and the aorta or the transplant artery and its anastomosis. There should also be satisfactory Doppler tracing from the proximal/mid- and distal segments of the main renal artery. Technical success has been reported in 76% of patients and 87% of arteries. ,, The aim of this study is to assess the sensitivity, specificity, accuracy as well as the negative predictive value (NPV) and positive predictive value (PPV) of DUS in the detection of significant RAS using CEMRA as the gold standard. Fifty-seven consecutive patients with criteria suggestive of RAS were recruited for this study and referred to the Radiology Department of the University Kebangsaan Malaysia Medical Center (UKMMC). The study was conducted during the period between June 2008 and March 2010. Three patients were excluded because either DUS could not be performed due a technically inadequate examination or because they had contraindications to magnetic resonance imaging (MRI). In this study, a total of 114 main and accessory arteries were studied. The age of the patient sample ranged from 18 to 81 years, with a mean of 56 years. There were 65 arteries in male patients (57%) and 49 arteries in female patients (43%). Majority of the study patients had high blood pressure and/or diabetes mellitus. The sample patients underwent both DUS and CEMRA of the renal arteries; the tests were performed within two months of each other. Findings on DUS were compared with CEMRA as the "gold standard method" for diagnosis of RAS. The investigators were blinded to the findings of the CEMRA and renal DUS. Renal DUS was performed using a 3-5 MHz phase array transducer on a mid-range or high-end ultrasound machine (HD11 or IU22, Philips Medical System, Bothell, USA). After a 6-8-h fasting period (except for medication), the same single sonologist performed all the DUS. Parameters measured on DUS were PSV-P, PSV-D and AT of the main renal artery, PSV-A of the aorta at the suprarenal level and the RI at the mid-, lower and upper pole segmental arteries of the kidneys. The PSV of the renal arteries and the suprarenal abdominal aorta were obtained in the longitudinal sections of these vessels. Epigastric transverse scans were used to identify the main renal arteries. The probe was directed supero-laterally (11 o'clock) for the right renal artery and infero-laterally (5 o'clock) for the left renal artery. Transplant kidneys were considered as the right or left kidney depending on whether they were located in the right or the left iliac fossa, respectively. PSV-P and AT of the main renal arteries were measured at the proximal or mid-renal artery, while the PSV-D was measured at the distal renal artery. The angle of incidence of the pulsed Doppler was maintained at less than 60 degrees. We performed direct imaging of the main renal artery using B mode and color Doppler where the caliber of the stenotic segment of the main renal artery, if present, was measured. Patient-related factors such as bowel gas, obesity, respiratory renal movements and poor patient compliance to breath holding. Anatomical variations of the renal arteries (such as multiple renal arteries, variations of site of origin of renal arteries) and anatomical variation of the kidneys themselves (horseshoe kidneys, crossed ectopia). Scanning factors such as relative inexperience of the sonologist at the early stage of the study period, difficulty in obtaining optimal Doppler angles and transmitted cardiac and/or aortic pulsation (which may obscure renal waveforms). CEMRA was performed using a 1.5 Tesla MRI (Siemens, Erlangen, Germany). CEMRA images were studied using the multi-planar reconstruction software to look for the presence of accessory renal arteries and RAS. Stenosis of the main renal arteries was noted and the diameters of the stenotic and post-stenotic segments were measured using the measurement tool on the work station. The percentage of stenosis was calculated using the following formula: Percentage of stenosis = stenotic diameter/post-stenotic diameter of main renal artery × 100. The data collected were analyzed using SPSS version 16.0. The accuracy, sensitivity, specificity, PPV and NPV for the detection of significant RAS were calculated for the four parameters PSV-P, AT, RRR and RAR; the results were then compared. The sensitivity for detecting stenosis was calculated as the number of true-positive findings according to DUS divided by the number of positive findings on CEMRA. The specificity was calculated as the number of true-negative findings according to DUS divided by the number of negative findings on CEMRA. The research was approved by the ethics committee of UKMMC. All the sample patients gave written consent. Fifty-seven consecutive patients were recruit-ted for this study, of whom three were excluded from the analysis. Overall, a total of 114 main and accessory arteries were studied. Technically adequate DUS was obtained in 95% of the patients. All the direct parameters were found to be in agreement for the detection of RAS [Table 1] and [Table 2]. Results showed 98.3% accuracy, 67% sensitivity, 100% specificity, 100% PPV and 95% NPV. Table 1: Data collected on color Doppler ultrasound in the study patients. Table 2: Calculated ratios on color Doppler ultrasound in the study patients. Most patients were successfully examined with DUS. These favorable results might have been related to the strict bowel preparation. The main limitation of this study was that patients were scanned using either of two models of DUS machine; the HD11, which is a mid-range machine and the IU22, which is a high-range machine. Such studies are best carried out using a single model machine in the high range. In this study, all cases with significant stenosis on DUS showed significant increase of PSV-P, AT, RAR and RRR of above 180 cm/s, 0.07, 3.5 and 2.7, respectively. This suggests that if the PSV-P was significantly increased (>180 cm/s), there was no need to measure the AT or calculate the RRR and RAR, as it is likely that the patient studied had significant RAS and would need further assessment with CEMRA or DSA. However, the investigators still advocate the measurement of AT even if the PSV-P was normal and to proceed with calculations of the RRR and RAR. This is a safety net because measurement of only a single parameter may cause an increase in false-negative results. An interesting finding in this study was that the false negatives on DUS showed irregularity of the outline of the main renal arteries on retrospective review. In conclusion, our study suggests that DUS is accurate in the detection of significant RAS. We suggest that aside from using the direct criteria parameters, when any irregularity of the outline of the renal artery is noted on DUS, further evaluation with tools such as CEMRA is warranted to rule out RAS. Dr. Elnasri M. Abuagla would like to thank his department staff for their support and the department head, Prof. Zahiah Mohammed, for his encouragement. 1. De Cobelli F, Venturini M, Vanzulli A, et al. Renal arterial stenosis: Prospective comparison of color Doppler US and breath-hold, three-dimensional, dynamic, gadolinium-enhanced MR angiography. Radiology 2000;214:373-80. 2. Olin JW, Melia M, Young JR, Graor RA, Risins B. Prevalence of atherosclerotic renal artery stenosis in patients with atherosclerosis elsewhere. Am J Med 1990;88:46-5IN. 3. Mailloux LU, Napolitano B, Belkicci AG, Vernace M, Wilkes BM, Mossey RT. Renal vascular disease causing end-stage renal disease, incidence, clinical correlates, and outcomes: A 20 year clinical experience. Am J Kidney Dis 1994;24:622-9. 4. Safian RD, Textor SC. Renal artery stenosis. N Engl J Med 2001;344:431-42. 8. 5. Kimberley JH. Prevalence of ischemic nephropathy in the atherosclerotic population. Am J Kidney Dis 1994;24:615-21. 6. Uzu T, Inoue T, Fujii T, et al. Prevalence and predictors of renal artery stenosis in patients with myocardial infarction. Am J Kidney Dis 2000;29:733-8. 7. Jacobson HR. Ischemic renal disease: An overlooked clinical entity? Kidney Int 1988;34: 729-43. 8. Crowley JJ, Santos RM, Peter RH, et al. Progression of renal artery stenosis in patients undergoing cardiac catheterization. Am Heart J 1998;136:913-8. 9. Zucchelli PC. Hypertension and atherosclerotic renal artery stenosis: Diagnostic approach. J Am Soc Nephrol 2002;13:S184-6. 10. Jaff MR, Olin JW. Atherosclerotic stenosis of the renal arteries. Indication of intervention. Tex Heart Inst J 1998;25:34-9. 11. Mann SJ Pickering TG. Detection of renovascular hypertention. Ann Intern Med 1992;117: 845-53. 12. Marcos HB, Choyke PL. Magnetic resonance angiography of the kidney. Semin Nephrol 2000;20:450-5. 13. Krumme B, Mann JF. Atherosclerotic renal artery stenosis is less confused than before? Nephrol Dial Transplant 2001;16:2124-7. 14. Leung DA, Hoffmann U, Pfammatter T, et al. Magnetic Resonance Angiography versus duplex sonography for diagnosing renovascular disease. Hypertension 1999;33:726-31. 15. Souza de Oliveira I, Widman A, Molnar LJ, Fukushima JT, Praxedes JN, Cerri G. Colour Doppler ultrasound: A new index improves the diagnosis of renal artery stenosis. Ultrasound Med Biol 2000;26:41-7. 16. Krumme B, Hollenbeck M. Doppler sonography in renal artery stenosis-does the Resistive Index predicts the success of intervention? Oxford Journals Medicine. Nephrol Dial Transplant 2007;22(3):692-6. 17. House MK, Dowling RJ, King P, Gibson RN. Using Doppler sonography to reveal renal artery stenosis. AJR Am J Roentgenol 1998; 173:761-5. 18. Conkbayir I, Yucesoy C, Edguer T, Yanik B, Yasar Ayaz U, Hekimoglu B. Doppler sonography in renal artery stenosis. An evaluation of intrarenal and extrarenal imaging parameters. Clin Imaging 2003;27:256-60. 19. Rabbia C, Valpreda S. Duplex scan sonography of renal artery stenosis. Int Angiol 2003;22:101-15. 20. Hoffmann U, Edwards JM, Carter S, et al.. Role of duplex scanning for the detection of atherosclerotic renal artery disease. Kidney Int 1991;39:1232-9. 21. Stavros AT, Parker SH, Yakes WF, et al. 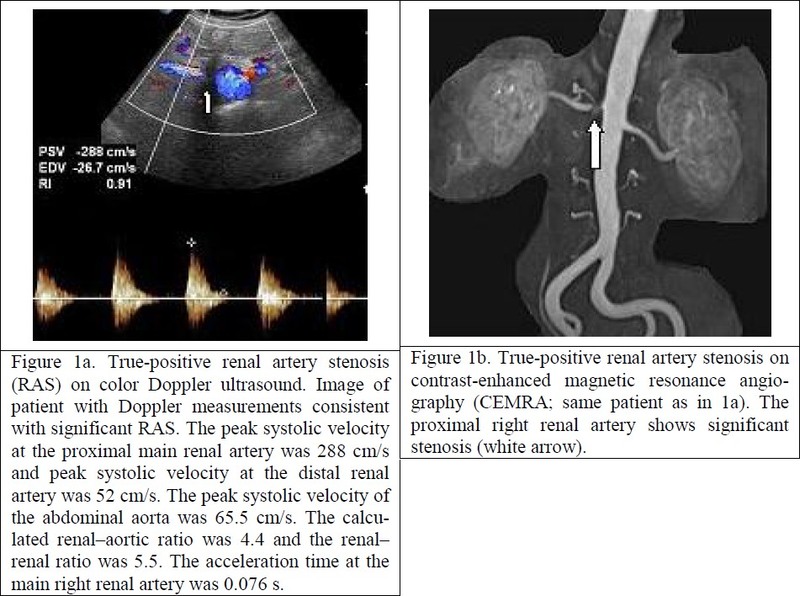 Segmental stenosis of the renal artery: Pattern recognition of tardus and parvus abnormalities with duplex sonography. Radiology 1992;184: 487-92.